The Wonder Boy series has sort of a complicated history. 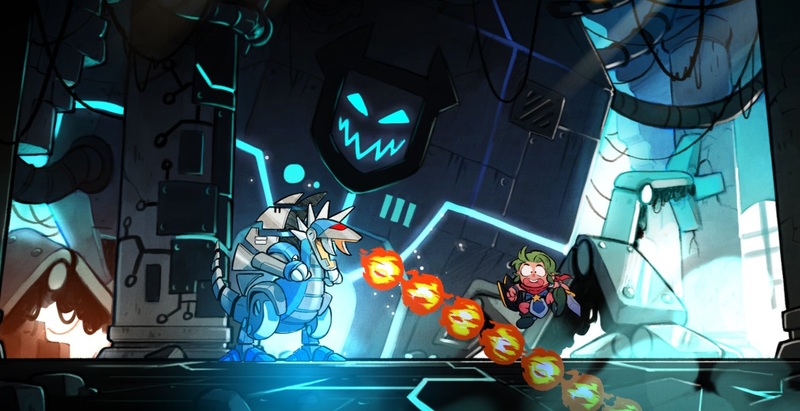 Several different franchises have claimed at least one of the series' titles, including Wonder Boy, Monster Land, and even Adventure Island. The Wonder Boy games were always confined to Sega platforms, which is probably why they didn't catch on like Adventure Island did. I didn't own any Sega consoles when I was growing up, and in the U.S., that places me squarely in the majority. Nintendo had a stranglehold on the video game console business in the late '80s, and the company controlled somewhere around 90% of the market when Wonder Boy 3: The Dragon's Trap was first released on Sega's Master System in 1989. I never got a chance to play the original, so I don't have any nostalgia for the title. Fortunately, a good game will hold up on its own merits no matter how old it is. 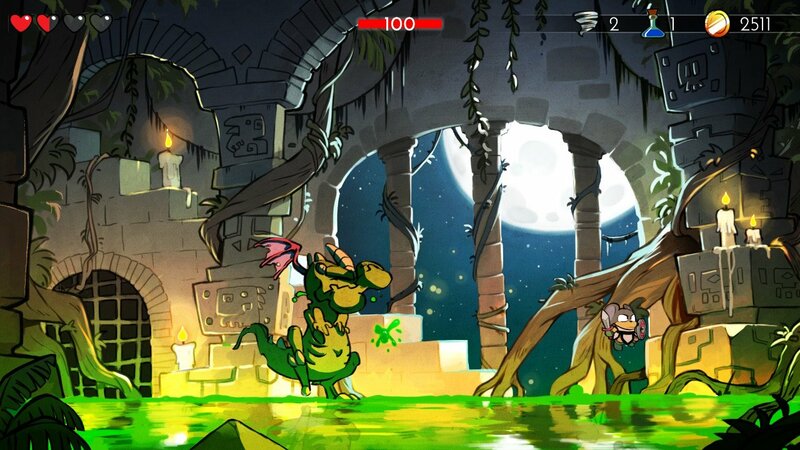 The closest comparison I can make to Wonder Boy: The Dragon's Trap is likely Capcom's remake of DuckTales from a few years ago. 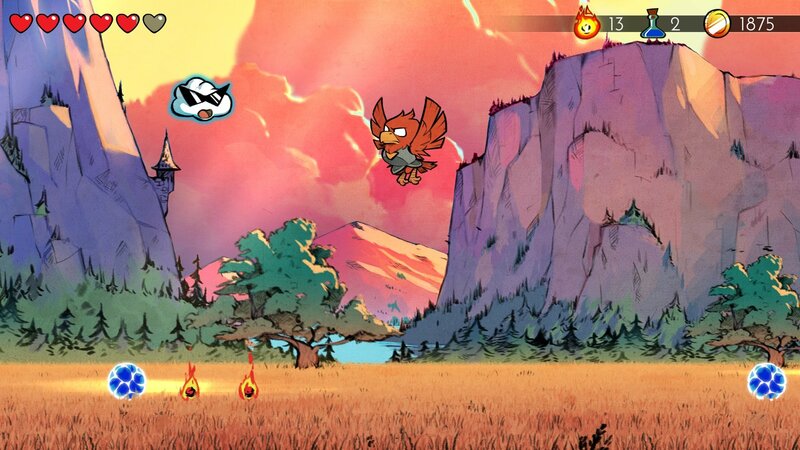 Both titles lovingly recreate a well regarded, tough 8-bit platformer using modern graphics and an updated soundtrack. 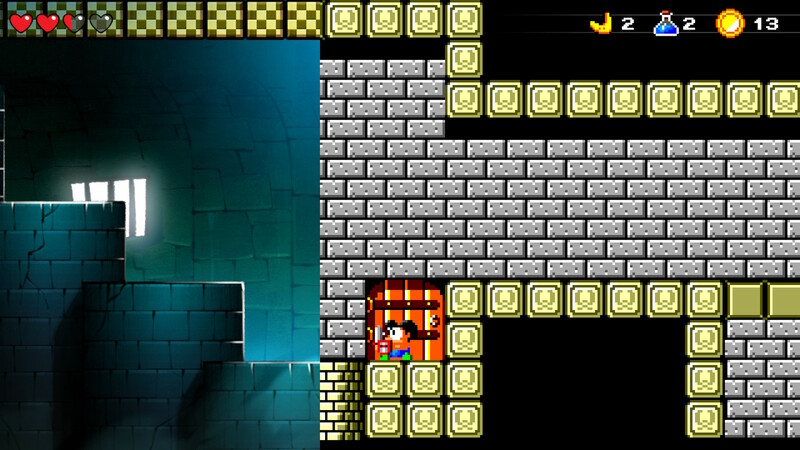 Unlike DuckTales Remastered, The Dragon's Trap allows the player to decide between the new, updated visuals or the 8-bit sprites of the original. The game starts as a simple 2D run-and-jump platformer. 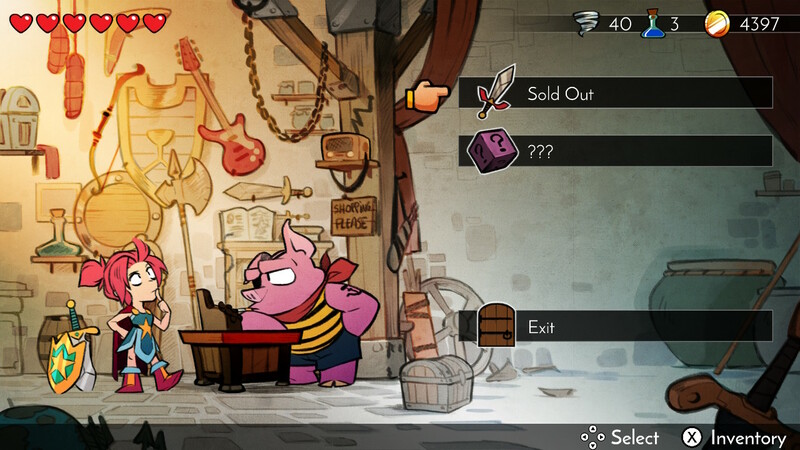 You can choose between Wonder Boy or (exclusive to the remake) Wonder Girl, a typical armored knight who can swing a sword, block projectiles with their shield, and use some Castlevania-style subweapons. These subweapons include short-range fireballs, an arrow that fires straight up to deal with pesky airborne enemies, and an extremely handy boomerang that you can reuse if you manage to intercept it on the return trip. After defeating each boss you're "cursed" into a different form, which dramatically changes how the game plays. Changing from a fire-spewing dragon to a mouse knight is a big transition, and it'll likely take a bit of practice to get the hang of your new body. Every transformation has some different weaknesses and abilities, though they share the same pool of weapons and armor. Using these abilities to access different parts of the levels is a huge part of the gameplay, and there are plenty of secrets hidden away that you'll want to try and find once you've unlocked a few of the different forms. It's a little more linear than a Metroid or Castlevania title, but you can see how the original developers might have been influenced by Samus Aran's first outing three years earlier. As you might expect, the title feels very old-school. 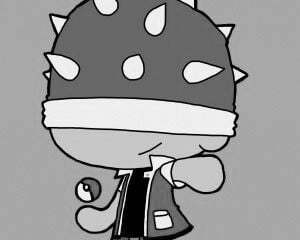 There's only a brief window of invulnerability after you take a hit, though multiple hits don't seem to cause combo damage. The blade you use to attack is also quite short, especially if you're playing as Mouse-man. You'll need to get in very close to attack, and it took me some time to figure out the different enemies' patterns and how close I had to be to stab them. Much like a Mega Man game, the gameplay encourages avoiding damage rather than favoring speed. There's no time limit, and I found that it worked out much better to be deliberate in my actions than fast and sloppy. While I don't have any particular nostalgia for this game, it's clear that the developers did. There's a lot of love that went into the hand-drawn artwork, and I noticed some fun little touches like marshmallows roasting on a stick near a lava pit, or a broken nurse's station in the Underground section that led to a secret room. Everything is beautifully, fluidly animated, yet manages to be absolutely faithful to the source material. You can swap the new aesthetic with retro graphics or sound, and mix and match on the fly with two button presses. There's a cool wipe effect when you switch between new and old graphics, and this tool makes it easy to see that all the hitboxes are identical to the 1989 version. Even if you want a retro experience, you might want to leave the new music on, as the soundtrack is excellent. Shiniki Sakamoto's 8-bit soundtrack was reimagined and recorded with live instruments, and it's all extremely catchy. I caught myself humming the town theme tune in the shower days after I finished the game. The controls are spot-on, which is good, because there's not a lot of room for error here. You'll want a controller with a good D-pad, since playing effectively requires precision I found hard to deliver with an analog stick. I still died quite a bit, but the penalty isn't too stiff. Dying means that you'll restart in town and all your subweapons will be taken away, but your money and equipment will remain. Sooner or later, you'll be able to save up for the best weapons and armor no matter how hard you find the gameplay. Eventually, you'll be able to transform between your various forms at will, though the game isn't explicit about how to do this. That leads me to my biggest complaint about The Dragon's Trap. I don't mind a challenge, but some better clues might have been helpful for newcomers to this title. I didn't discover that there was a transformation room near the hub town until very late in the game, and as a result ended up banging my head against a wall in the Underground section without realizing I didn't have to play through it as the mouse-man. Since the mouse literally cannot hit the boss of that section with his standard weapon, I was under the impression for a couple of hours that I had screwed up my save and would have to start over. Eventually, I looked up a FAQ for the older version and figured out how to progress, but I was thoroughly exasperated trying to defeat the ninjas and samurai in that section with his pathetic blade, only to reach a boss that I couldn't even jump high enough to hit. The rest of the game was good enough to keep me playing, but I'd advise that there's no shame in looking up what to do if you get stuck. That does tie in with the other possible hangup some folks might have. It's important to remember that this game was designed and programmed in 1989, and while it's quite fair, it can also be frustrating if you're not willing to learn enemy patterns and adjust your play accordingly. If you thought DuckTales Remastered and Mega Man 9 were too hard, this is probably not the game for you. Even though the Master System was an also-ran next to the NES's dominance, there were some real gems created for it, and Wonder Boy 3 just might have been the best game released on the platform. Lizardcube and DotEmu have done a lot of work to bring The Dragon's Trap up to today's standards, and the new version plays as good as it looks. It's plain to see how much effort went into making this into the best possible version of a game that deserves to be a classic, and it's absolutely worth your time.